As the most comprehensive resource in the world on Ben Enwonwu, we seek to support, generate and disseminate research on the artist by welcoming scholars through formal research opportunities, collaborative projects and by hosting talks and conferences. Our work involves facilitating contact and exchange to foster networks that extend beyond the confines of the academia. 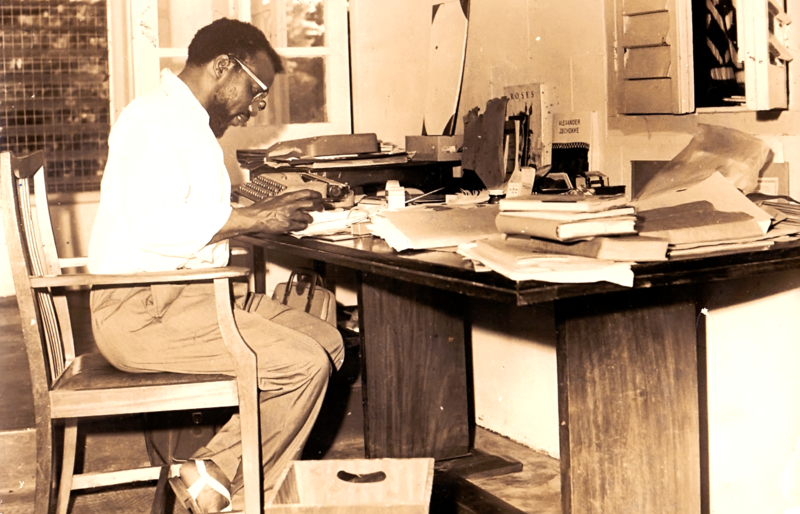 Our research, curatorial and archive staff continue to document Enwonwu's life, archive and work through on - going examination of his philosophy and techniques, which contributes largely to our extensive programme of exhibitions, events and publications. The Foundation's research also focuses on sculpture and painting in Africa, two media Enwonwu worked extensively in. We position them as complex and dynamic subjects of enquiry, as well as at the centre of current art historical scholarship by representing established practitioners and including neglected ones into existing narratives. Plans are in place to make public our research, which will be organised into specific areas of inquiry. Platforms will include conferences, seminars and lectures. Dialogues will also be recorded and made available in our digital library or published as online papers. The Foundation seeks collaboration and welcomes research proposals on Ben Enwonwu, as well as the practice and teaching of sculpture and painting in Nigeria. Continuing investigation into Enwonwu’s artistic output has resulted in the discovery of several, previously uncatalogued works, the Foundation will share with the public through a new project to publish online the complete works of Ben Enwonwu. On request, we also undertake authentication research on works believed to be by the artist. From 2018, the Foundation will invite applications for two funded internships from across MA programmes at Nigerian universities. The internships are aimed at students who have a research interest in sculpture and painting. Internships relating to our collection, exhibitions and research programme, involve students working closely with members of staff. The timing of each internship will be arranged according to the applicant and project schedule. Travel and, if necessary, accommodation will be provided. 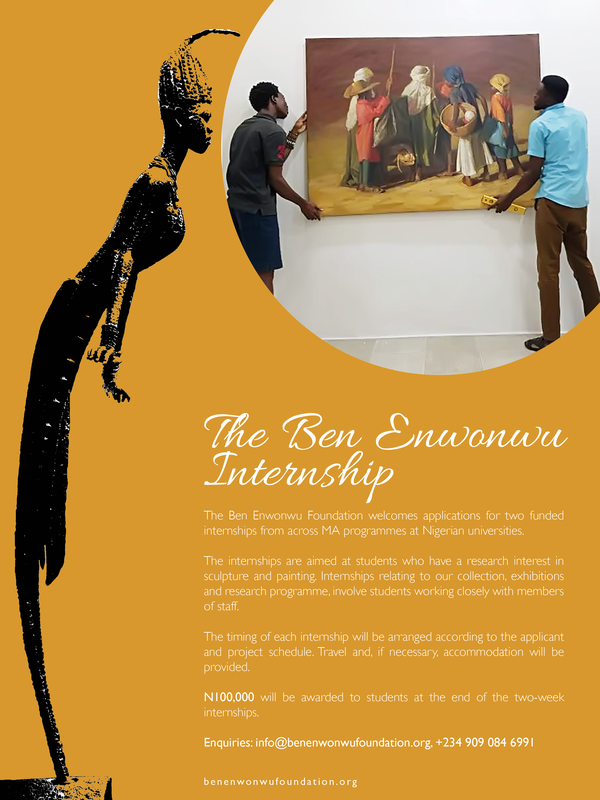 An award of N100,000 will be given to students at the end of the two-week internships. Interns will have the opportunity to learn about an art foundation by working on projects alongside renowned artists and curators. The BEF accepts applications for internships, from which students in tertiary institutions in Nigeria gain academic credit. Getting involved is an excellent way for students to learn about art, and about the people, organisations and agencies that play a role in shaping the art world. The Foundation works closely with local and international government agencies, non-governmental organisations, and other academic institutions that may be relevant to the future career interests of students. The BEF accepts applications for internships only for undergraduates. Preference is given to students of fine and applied art or those that have prior experience in an art foundation, though they are not requirements. Applications are welcome from all students who are interested in learning about art and how art foundations work. As part of the Foundation's research programme, two prizes will be awarded in 2018, for writing on contemporary, modern or historical sculpture or painting. 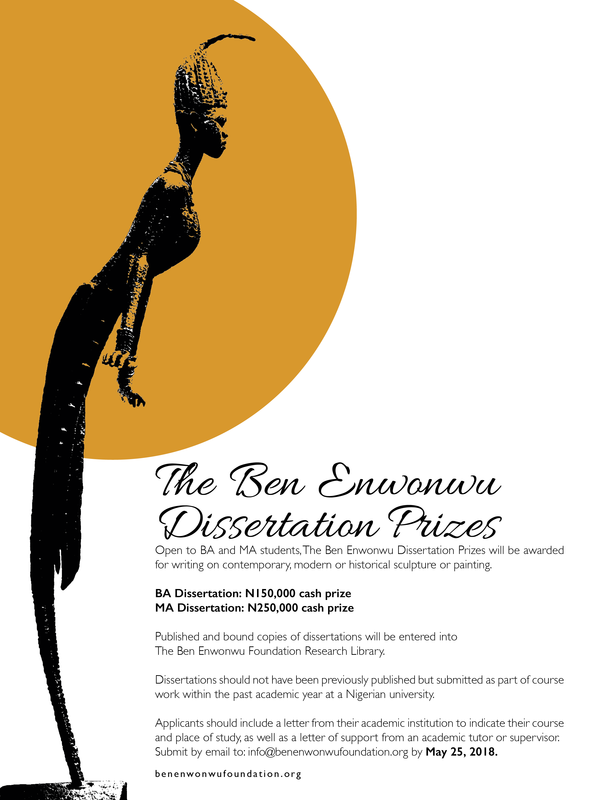 The Ben Enwonwu Dissertation Prizes are open to BA and MA students. Submitted as part of course work within the past academic year at a Nigerian university, dissertations should not have previously been published. Essay should be submitted by email to: info@benenwonwufoundation.org by May 25, 2018.